Cao lầu, in its traditional form, can never be globalized. 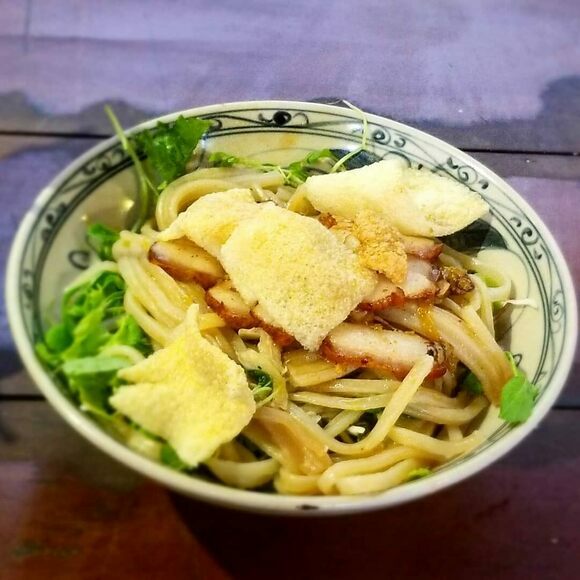 Though the dish is a melting pot of Vietnamese, Chinese, and Japanese culinary techniques and its stir-fried, fatty pork and garnishes of herbs, crispy rice crackers, and pork crackling can be replicated, the dish’s star ingredient cannot. Made with local wood ash and alum-rich well water, the starchy, thick rice noodles rely on the terroir of Hội An, Vietnam. This coastal city is extremely well-preserved. Its canals, wooden Chinese shophouses, French colonial architecture, and pagoda-topped Japanese bridge reflect its role as an international trading port from the 15th to the 19th century. Hội An’s historic quarter has been a UNESCO World Heritage Site since 1999. Historically, the water of Ba Le—a well located in the center of town—was said to gave caul lầu noodles their distinct texture. The other key recipe component, ash, was obtained by burning wood from a tree that grows on the Cham Islands, about 13 miles off-shore. About 150,000 people live in Hội An today, but one family is responsible for all of the cao lầu noodles in town. Their empire extends back four generations, when a chef from China taught the current noodle-maker’s great-grandfather the recipe. It’s stayed a closely-guarded secret since. Upon being interviewed by Afar magazine, the family confirmed that they used to rely on Ba Le’s water, but stopped. They now have their own well, which produces water with similar properties. They also no longer source wood from the Cham Islands, but use the same kind of trees to produce their ash. The process begins with boiling local rice in ash-enhanced water, which lends the noodles their signature chewy texture. The cook pounds this into a dough and steams it. Afterward, the batch endures kneading, rolling, cutting, more steaming, and, eventually, a cooling session beneath banana leaves. The family’s senior noodle-maker assumed his role at age 12, and his son delivers the goods to local restaurants. Water and wood matter, but one family’s tradition, dedication, and technique truly makes cao lầu unreproducible anywhere else. This casual cafe specializes in cao lầu.